Endless Ocean Views & lovely decor make this Pelican Watch townhome an excellent choice for your families Beach retreat. Enjoy the cool breeze from the Atlantic from one of the many decks or take the kids for a dip in the Community Swimming Pool. This home is very well equipped & has 2 Master Suites & many extras including a well-stocked kitchen, books, porch swing, picnic table, & all of the bedrooms have TV's. After a day on the Beach you can relax in the Hot Tub located on the top level Sun Deck where you can marvel at the beautiful star lit sky. Ground Level: Parking for 3 Cars, Carport, Entry to Home, Walkway to Adjacent Community Dune Deck & Beach Access, & Enclosed Outside Shower. Mid Level: Living/Dining/Kitchen Area, TV, DVD, Great Ocean Views, Half Bath, Master Suite w/Queen & Full Bath, Oceanfront Covered Deck w/Picnic Table, Porch Swing, Deck Furniture, & Another Covered Deck. Top Level: 3 Bedrooms (Oceanfront Master Suite w/King & Full Bath w/Jacuzzi & Shower, 1 w/ Queen, & 1 w/2 Singles), Shared Hall Bath, Outstanding Views of the Ocean & Beach, Laundry Area, & Sun Deck w/Hot Tub & Deck Furniture. 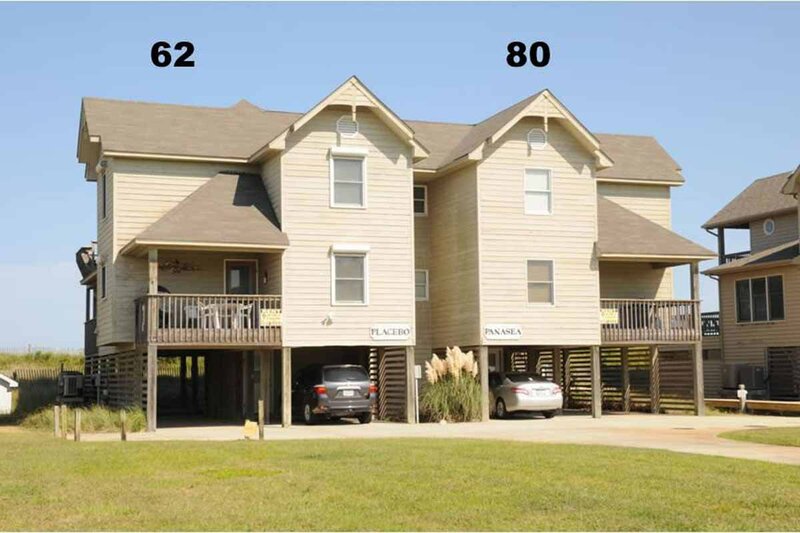 Features include: C/AC & Heat, Washer/Dryer, Dishwasher, Phone, Ceiling Fans, 5 CATV's, DVD, Wireless Internet, Porch Swing, Deck Furniture, Gas Grill, & Great Ocean Views. A Member of the Southern Shores Civic Association (SSCA) which provides you w/No Fee Access to 4 Miles of Southern Shores Beaches w/Parking, Boat Launching Area, 3 Soundside Marinas, Soundside Bathing, Beach, & Picnic Area, Sea Oats Park/Play Ground, & Walking/Biking Trails. No Pets. This is a Non-Smoking Unit. To see more about Pelican Watch community amenities visit their information page. Kitchen is the best stocked that I have ever rented. Furniture was updated and comfortable. Location and views are wonderful. The location couldn't be any better. The home was beautiful and and a wonderful comfortable atmosphere to it that made you feel as if you were staying at a friend's house. Anxious for the beach restoration to enlarge the beach. Beautiful home, excellent location. Loved everything. Already booked the house for a repeat stay. Loved your home! We enjoyed it so much and would love to rent again sometime. This house is very spacious and has an incredible view !! It was great that the house had so many games and books! Panasea was a great place to stay. Easy access to the beach, close to the Harris-Teeter, and comfortable beds. We had a great time!